British designer ARM chipsets announced its Cortex-A17, a new architecture for smartphones and tablets mid-range 2015. 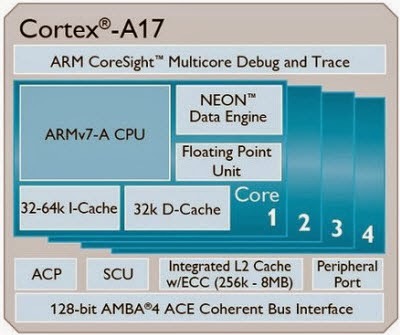 ARM trying to strengthen its leadership in mobile devices by unveiling a new architecture called Cortex-A17. It is designed to equip smartphones and tablets mid-range next year. According to data from ARM, it is 60% faster than the previous generation Cortex-A9. The architecture is designed for use with processors engraved 28nm, and more clocked at 2 GHz. In addition, ARM Announces Support big.LITLLE its technology via CoreLink CCI-400, which recall the processor allows a very low consumption of low-intensive applications and other more powerful for other uses requiring more power. This system serves primarily to improve the autonomy of devices. Meanwhile, ARM offers a GPU Mali-T720 to complete the Cortex-A17, as the video solution Mali-V500 (to support 4K resolutions in particular). Several manufacturers have already announced their support for this new architecture: MediaTek, Realtek or VIA Telecom.